We did it! We finished Genesis. (I’ll have to go back and add everything before Noah later.) Now to the book of Exodus. Anybody here seen “Prince of Egypt”? It may be the most visually beautiful gem of a movie in the history of cartoon. It’s basically the Moses story you grew up with, but a lot more personal. …so back to Egypt. The Egyptians feared an Israelite uprising, so they enslaved them. This still didn’t make them feel safe- now the Egyptians knew they’d given the Israelites one more thing to rebel against! So they became so racist (see how this becomes a vicious cycle? ), they decided to kill all the newborn male children of Israel. It’s hard to picture that level of massacre in the world today. Once in a while, some spot of the world reminds us what humans are capable of. Right now the Burmese military is under investigation for an ethnic cleansing of its Rohingya minority, Muslims in a Buddhist country. Those days aren’t over yet. Anyway. Luckily Moses’ birth-sister Miriam (who gets called a Prophet for one sentence when they all leave Egypt and says literally nothing else that she did) was following the basket. So she speaks up and offers to find a Hebrew woman to raise the baby, because apparently Pharaoh’s wife (Pharah?) wants to have a baby but not actually raise it, and Pharah offers to hire the woman. So Miriam brings her own mother to nurse and raise her own baby, until he’s old enough, and gets paid to do it! If you’re a mother this should make you jealous, because motherhood should be paid and it isn’t. Did I mention this baby is Moses? In “Prince of Egypt,” Moses grows up side-by-side with Pharaoh’s son, as second-in-line for the throne. Their father is the same man who tried to kill every little boy, when Moses was supposed to be one of those little boys. This actually didn’t get pointed out too much in the film. He sort of finds out he’s a Hebrew when he’s going for a princely, suspiciously guard-less walk and comes across Miriam and their brother Aaron, and Aaron yells at him for not stopping racism. Then Moses has a Loki-breakdown and kills that slavemaster and runs away in shame. Now the stories line up again. Moses wanders in the desert until he gets to a desert tribe, which takes him in. He starts a new life, gets married, has a great musical number by her dad (sadly not in the bible but seriously I’ve got the DVD and we could do movie night), and becomes a shepherd. That’s when he wanders into a cave…. There’s a lot more detail here than the quick Sunday School version gave you. First, it says the bush is burning because of the presence of an angel. Then the voice of the Lord comes out of it. Which is it? Did the Lord travel with angel bodyguards? Was the author not sure how to taxonomize the supernatural and tell which was which? So at this point, Moses doesn’t know much about God. His mom may have told him a few things when he was little, maybe. And then he got raised by Egyptians who taught that his dad-in-law was a god too. But God has to introduce himself. Which God is he? “I am the God of Abraham and Isaac and Jacob.” That’s an important distinction to make right now. Then God tells him to go back and stop racism. Free the slaves. He’s asking a guy who was raised by slavemasters and then fled to live way away from all that, and whose only connection to them is the birth family he barely ever knew. So Moses puts himself down saying he’s bad with people and no one would believe him anyway. And God says, all right, let’s break out the miracles here. He hasn’t event defied physics since making the universe (except for however he blew up Sodom), so, time for some transfiguration. He shows him he can turn his staff into a snake. He just….has to…grab the…tail to turn it back into a staff, which sounds difficult. And if they dont believe that, he says, put your hand in your robe and pull it out. He pulls it out and it looks pale, withered and dead. A little warning would’ve been nice. That’s not a miracle you want to use on yourself. But God tells him to put it back and his hand’s fine again. Last chance: take some water from the river and pour it on land and it’ll turn to blood. One of those will convince people. Moses still thinks someone else should be doing all this. So, God sighs (probably) and says you know what, fine, your brother Aaron can split the job with you. And thats the last time he let a prophet at all not do what he commanded them to do. Now God fleshes out the plan a bit. He won’t just ask politely for his dad-in-law to pass the 13th amendment. God will go to war with him. He’ll “smite Egypt with all His wonders” to prove that the greatest, most powerful, most terrible people in history can still lose, if they’re on the wrong side of history. And all Moses had to do was speak truth to power. The Israelites didn’t even need to lead a civil war themselves. They didn’t need to lose half a million lives fending them off, whether they stood their ground in Egypt or not. God did it instead. That contrast to the alternative helps, when you wonder how God could have killed all those people. Most of those people were killers already. God tells Aaron to meet him partway. They barely knew each other, but that’s the one thing God said to Aaron. Everything else, God said Moses should just tell Aaron himself. Really everything Moses and Aaron say after this point is like that: God gives Moses step-by-step instructions, teaches him his lines, and Moses tells Aaron. When they get to the Israelites, they do the 3 miracles, and tell them about the plan to free them, and everyone is loving it. Everyone is on board. Then Moses and Aaron talk to Pharaoh about it. It wasnt a closed-door session – it was in front of all Pharaoh’s favorite people. Moses makes his staff a serpent in front of a room of Egyptian-God-believers. And Pharaoh’s magicians – wise men or sorcerers or whatever your translation says – they make their rods (not staffs, just rods, I don’t even know what you do with a rod but I guess I know now-) they make their rods into snakes. How? Dark magic? Other gods powers? or just smoke and mirrors switching out a rod for a snake? My take on it is that some translations say they did it “with their secret arts,” and I take that as being just theater magic. After all, look at the entire Bible- when does any power but God do anything supernatural? Scrape the bottom of the barrel and you’ll find a talking snake, one necromancer who could only bring back a spirit so they can talk to people, and…..and…some possessions in the New Testament. Add to this list if you think of more. Oh, end of scene: Moses’ *ahem* God’s snake eats the others. I was waiting for Pharaoh to say something here. As far as he cares, this isn’t a political statement or a holy war, this is a magic show. So Moses has to come back later and talk to him. God’s gone over the script – but it isn’t “let my people go.” Moses isn’t even going to ask Pharaoh to liberate half its people. He’s going to ask to let them take the weekend off. He asks Pharaoh to let his people take a 3-day journey into the desert to make sacrifices to their God. (This is not where Burning Man came from. Nor was it a concert.) Then if Pharaoh says no, He tells him to put his staff in the water and all the liquid water in Egypt will turn to blood. But since God only goes over what to say, and the next thing we know Moses is striking the water, we don’t hear Pharaoh’s comeback. Moses has just made the ultimate gift to vampires and fans of The Shining. There are nine more plagues after this. Plague #2: frogs. That really doesn’t sound so horrible. That’s probably why it’s one of the first. Granted, it says they were climbing on everyone. This must have been when gumbo was invented out of desperation. *googles* no, that’s shrimp and crab. My apologies to New Orleans. But really, this would have been terribly annoying. 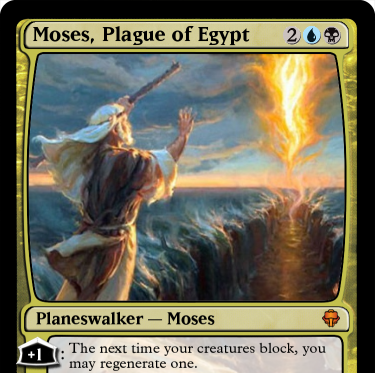 So Pharaoh asks for Moses to stop the plague, agreeing to let them have their holiday weekend, and Moses (well technically God) calls off the frogs. They die and get swept up in heaps and stink up the place. And then Pharaoh decides to keep the slaves in Egypt anyway! So, Plague #3. Gnats. Or lice. Not sure how historians could have mixed that up, but it was one of those two and they got on everyone. The magicians try to copy this – no luck. They even tell Pharaoh this plague must be the finger of God. No luck. Plague #4: flies. Probably won’t kill anyone, but too bad all the frogs are dead. This time God specifies He sent them over all of Egypt except where the Israelites lived, in Goshen. (Maybe that’s why people say Gosh instead of God.) And Pharaoh does the same bait-and-switch again. Plague #5: livestock. And God rained livestock upon Egypt, and it was more terrible than any rain of cats and dogs that they had ever seen. Nah, it’s a plague against livestock. They got sick and died. That one hits me right here (I’m indicating my heart – actually I’m typing to say that, but I was indicating my heart). They were innocent victims in this. I do have this to say about this plague, though – most of them were naturally-occurring things. In other words, God or no God, plagues still happen. You can try to blame God for targeting them at certain people, but if there’s no God, will people be just as angry about it? They just don’t have someone to blame anymore. Plague #7: a storm of hail, thunder, and… it’s translated as either lightning or fire. Another important distinction I wish I knew which it was (but everything else said about it just talks about the hail, so I guess the rest is cosmetic). God warns the people (though that really depends on how fast people spread the word) to get out of the fields, as everything in them will be beaten down and struck; the crops are flattened, and the trees are shattered. Plague #8: locusts. For some reason this is the one everyone talks about. Probably because it’s distinctive. They’e like grasshoppers. And they ate everything. Not human flesh. Just everything edible by non-Willy-Wonka standards. Plague #9: Darkness. “Stretch your hand toward the sky and there will be darkness over the land of Egypt, a darkness that one can feel.” That’s edgy. I don’t know if that’s more horror or more metal. And I don’t just mean that in a ‘come on, kids, the Bible’s cool’ sort of way. It says everyone outside of Goshen was caught in a blackness so thick they couldn’t see the person next to them. They just huddled in terror in their homes until it passed over. I don’t think that’s how the eclipse went. Plague #10: Death of the Firstborn. This is the kind of moment that most people have a problem with. That’s understandable. No, it’s more than understandable. If a human did this today, there would be outrage from every corner of the globe! The firstborn of every family, even of every animal died that night. It’s moments like this that make people call religion backwards and barbaric. There are countless pacifist Christians, but they define themselves more by the New Testament than by moments like this. But I should share the explanation I’ve heard. When a person dies, especially someone as young and innocent as a child, where do they go? They didn’t have a chance to fail God; they hadn’t matured enough, they couldn’t have made a decision about who they were going to be. So they didn’t deserve Hell. They could only have gone to Heaven. This still made their families suffer… but this was a war to free half the nation. And this ended the war. With Pharaoh’s own son dead, he bade the Israelites to go. Also the 10th Plague and the packing up to leave were when Passover was invented. They make a very big deal about God saying this is the day and this is how you must celebr – actually it’s pretty sober-sounding. Aaaand that brings us to the end of Exodus 12! Stay tuned. But not too tuned, I can’t decide if I work well under pressure. Next Deserted in the Desert without Dessert: did they Deserve it? Is it on you’re blog? Pretend I said “is it on your blog.” But really, where can I see and/or share about them? Cause that deserves its own post!